The lyrics to this popular Christmas carol were written by Edmund Sears, pastor of the Unitarian Church in Weston, Massachusetts. No movie scenarist could have devised a more romantic setting for the composition of a Christmas poem. Reportedly, it was a cold winter day in December 1849. Outside, a snowfall was in progress and inside, the fireplace in the study was erupting with warmth and light. No doubt this picturesque New England scene and the holiday season inspired the frail minister, and his pen scratched out several stanzas of verse about the birth of Jesus. A year later, in 1850, a tune by Richard Storrs Willis, a composer who trained under Felix Mendelssohn, was published under the title “Study No. 23”, set to the hymn “See Israel's Gentle Shepherd Stand”. Soon after the tune was rearranged to fit Sears' poetry — probably by Willis himself, although some sources state that Uzziah C. Burnap was responsible. 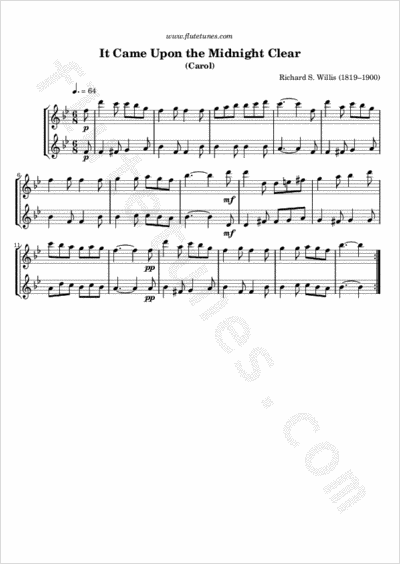 The melody, now simply known as “Carol”, has become the most widely-known tune to the song in the USA, although other tunes exist; most notably, “Noel” by Arthur Sullivan, which is based on a traditional English air. A variation in Willis' music has appeared during the course of the 20th century. The third note of the melody, which is played to the first syllable of the word “upon” in the first verse, was originally the same as the fourth note, i.e. C in the original key of B-flat major. Following an influential Episcopal hymnal, where the variation first occurred, the third note is now often sung a third below, making it an A. Since notable recordings exist for each one of the two versions, now both are generally accepted as “correct”.